"KLONDYKE" Flask - This is a nice example of an very interesting bottle with some well documented history. Recently (September 2014) an article was published in "Bottles and Extras" - the official publication of the Federation of Historical Bottle Collectors - about this very bottle. (It was written by Jack Sullivan.) Long story short is that these small liquor flasks were invented and used by a George Smithhisler - a Mt. Vernon, Ohio liquor dealer - who dreamed up the flask as a tribute to one of the last gold rushes of the West - the Alaskan Gold Rush (which was mostly in Canada strangely enough). 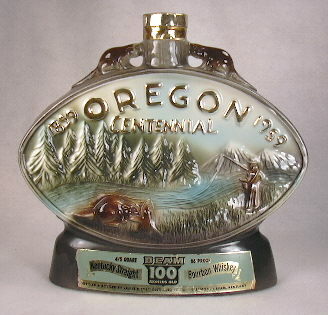 The flask is supposed to portray the snowy white mountains of Alaska. Gold was discovered on the Klondike River (Yukon) in 1897 and started what many then believed would be the last gold rush in the West and of which they wanted to participate for that reason. The California Gold Rush of 1848-1849 (and on) spawned the famous "Forty-Niners" rush; the Klondike (also spelled Klondyke...like on the bottle's label) created the "Ninety-Eighters" as many rushed up to participate in 1898. So these flasks apparently date from about 1898 into the very early 1900s as Smithhisler was out of the liquor business by the 1910 census. The label which is pictured in Sullivan's article noted the contents as containing "Nuggets of Pure Gold from Klondyke"...aka "whiskey," I guess. The label fit the round flat panel one can see in the image. Dip molded case gin - Offered here is a nice, fairly early, 19th century case gin bottle which is possibly Dutch in origin, although American-made can't be ruled out. This example is probably about a quart in capacity, stands about 9.3", has a tapered "oil" type finish (most dip molded gins have a flared finish; this is a bit unusual for its age), and is a deep - but still passing light easily in a window - olive amber coloration. 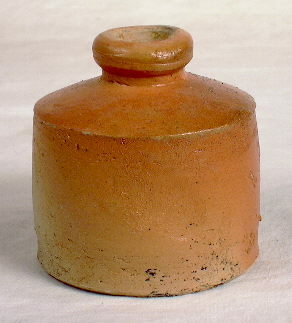 Although not pontiled, this bottle has an unusual indentation in the somewhat domed base that could be a refired pontil? I don't know for sure but the following link shows an image of what I'm talking about: base view. (This image also shows the cool glossy surface to the bottle.) This indentation may also be from the use of a "push-up" rod used to indent the base - something one sees now and then on non-pontiled bottles (on pontiled bottles, the "push-up" was usually created with the pontil rod itself). There is no evidence of mold seams which is consistent with it having been made in a dip mold along with a very smooth, glossy surface to the glass in the shoulder which would have been formed by the blower using plain, old fashioned skill. (If unfamiliar with that type of molding, see my other educational website for a overview of such at this link: http://www.sha.org/bottle/glassmaking.htm#Dip molds. 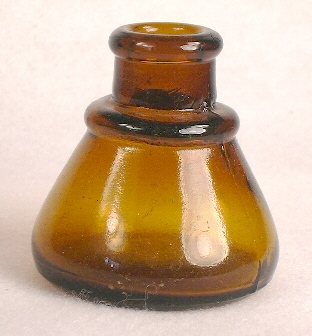 The bottle pictured... is embossed on one narrow side with PARKER'S, on one wide side with HAIR / BALSAM, and on the other narrow side with NEW YORK. The remaining side is not embossed and has the label shown in the image. 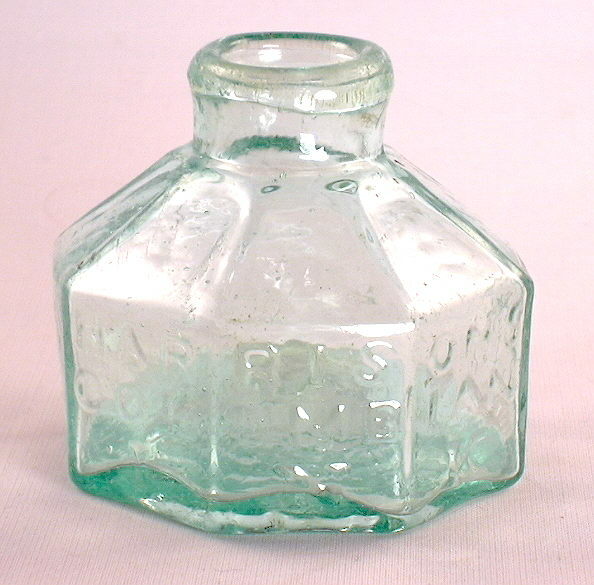 It is 6.6" tall (this was the large size) and an early machine-made bottle dating from the... 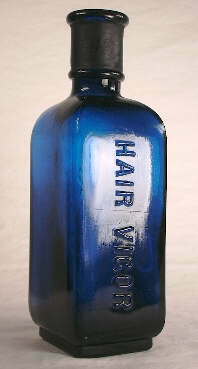 The larger label notes that it "A toilet preparation of high standard, used for imparting color to gray or faded hair." In other words, it was apparently a hair dye or re-colorant on the order of our modern "Grecian Formula" and similar products. Click reverse view to see the label on the reverse side - pasted right over the HAIR / BALSAM embossing - which notes the product contained as "Floreston Shampoo" which seems to be a contradiction to the main label on the other side. 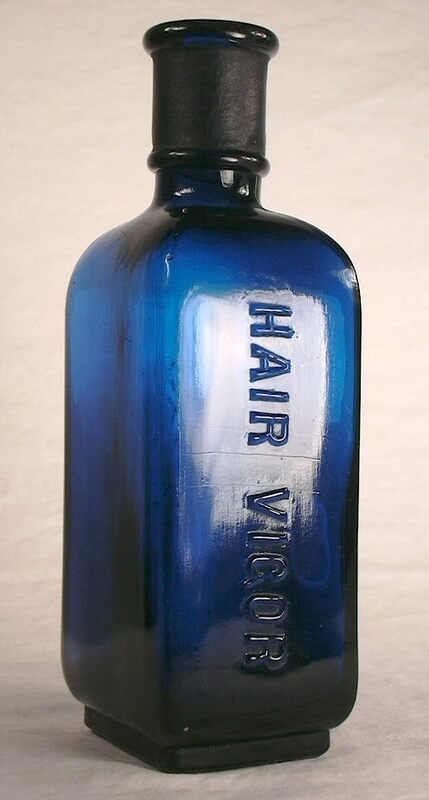 Both labels note the product was produced by the Hiscox Chemical Works of Patchogue, N. Y. so it appears that this bottle was used for the hair balsam first, then reused by the same company for the shampoo? In any event, according to Blasi (1974) the product was first sold in 1876 by David Hiscox of New York eventually becoming the Hiscox Chemical Works in Patchogue, NY (located on Long Island). It was marketed until at least 1948 (Fike 1987). According to the AMA (1921) the product was found to be "...a solution of lead acetate with suspended salt. The lead salt is poisonous." Click close-up of the shoulder, neck and double ring finish to see such. The horizontal ring mold seam can be seen just below the base of the finish - a sure sign of a machine-made bottle. Click base view to see such including the flattened diamond used reportedly by the Diamond Glass Company (Royersford, PA.) to mark its products beginning in 1924 - about the manufacturing date of this bottle. These bottle can be found in a several sizes, mouth-blown and machine-made manufacture, and in at least a few different colors, i.e., aqua, amber, and olive green. The tea kettle inkwell or ink bottle pictured is another ink that crosses the line between being an inkwell or simple ink bottle. Like the aqua center hole ink bottle above this bottle also has a cheaper, utilitarian look to it compared to the cobalt blue teak kettle ink bottle above, which certainly was intended for indefinite use. Of course, this bottle could have been reused after the initial purchase with ink. It has a tooled straight finish which accepted a cork closure, an eleven sided body, and has no evidence of mold air venting. It was (apparently) blown in a true, though asymmetrical, two-piece mold where one portion of the mold formed the base, heel and underside of the neck with the other portion forming the entire body and upper portion of the neck. The base is embossed with PAT JULY 13TH / 1880; click base view to view such showing the embossing. Below the patent date is a marking which appears to be three interlinking circles with some faint letters in each circle which is either an unknown bottle makers marking or is related to the company that used the bottle. To view the actual design patent click: Design Patent #11,868. The patent notes that this was called a "Fountain-Bottle" and specifically patented for the spout angle and bulge at the base of the spout, the pen rests on the top of the body, and feet bumps on the base (see base image) - or all those features in combination. The patent was granted to one Michael H. Haggerty of New York, NY. A search of the few references on ink bottles listed the bottle but nothing about what company used the bottle, what the noted marking on the base may mean, nor anything about Mr. Haggerty. 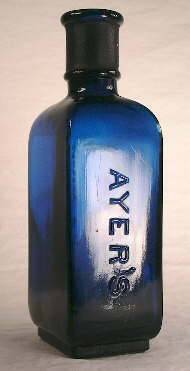 Covill (1971) did note a variant of this bottle that has PAT. APPD. FOR on the base indicating manufacture between April 9, 1880, when the patent application was filed, and July 13, 1880 when the patent was granted! Since these bottles are fairly scarce in the authors experience, they were probably only made for a few years in the early to mid-1880s. 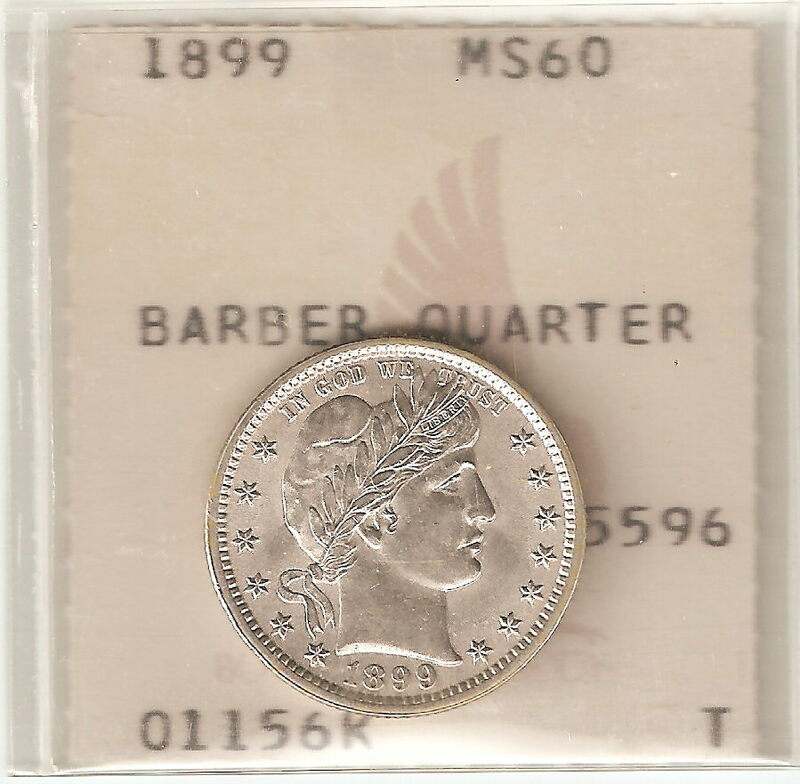 1878 CC Uncirculated Morgan Silver Dollar - This is one of those uncirculated Carson City mint silver dollars that was removed from the plastic holder that the mint sold them in (I removed it many years ago). 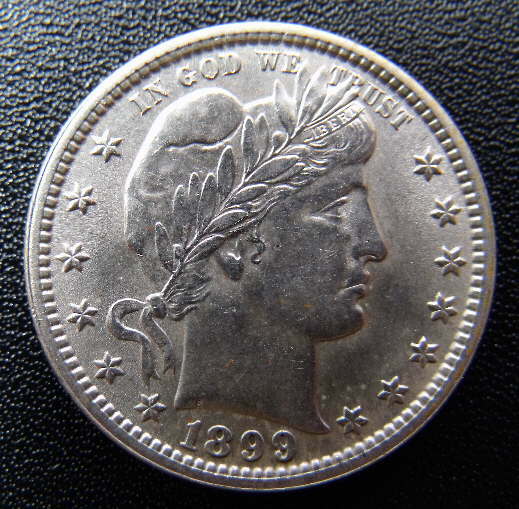 The date of this is 1878 - the first year of the Morgan dollars I believe. It is mint condition, but what grade - MS-60 or MS-62 or ? - I don't know, so I'll call it MS-60+. However, potential buyers can click on the thumbnail images to the left to view much larger versions of the images that will show you the finer details...so you make the grading call. As far as I can see it doesn't have much in the way of distractingly large scratches or gouges, pretty clean cheeks, a good strike although not much in the way of "frosting"...so it is probably between MS-60 and MS-63. I've recently replaced the harsh scanner images with digital camera images taken in direct natural light for a better "look" at these coins. Nice example of a coin made with genuine Nevada - Virginia City/Comstock Lode - silver! Coin now in a mylar flip. SOLD! 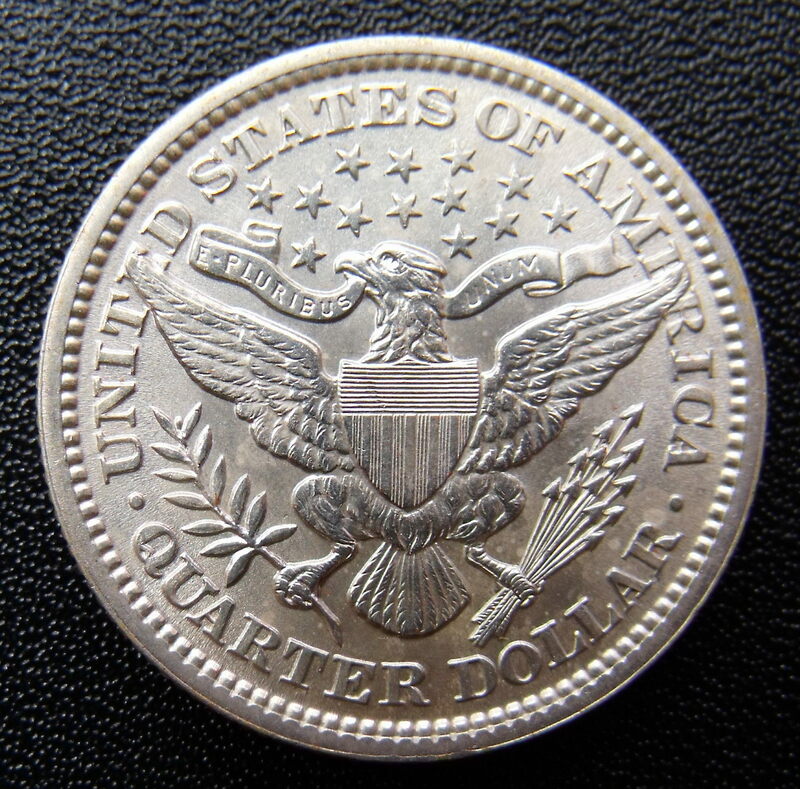 1880 CC Uncirculated Morgan Silver Dollar - Here is another uncirculated Carson City mint silver dollars that was removed from the plastic holder that the mint sold them in (I removed it many years ago). The date of this is 1880. It is mint condition, but what grade - MS-60 or MS-61 or ? - I don't know, so I'll call it MS-60+. However, potential buyers can click on the thumbnail images to the right to view much larger, higher resolution versions of the images that will show you the finer details...so you make the grading call. ROGER'S / NURSERY / HAIR LOTION - This is very unique bottle due to the beautiful rainbow iridescence "patina" from a rare "positive" interaction with soil this bottle was buried in. Click on the images to the left to see the different colors that this bottle has depending on the direction of the light (two different light angles). The same portions of the bottle have blues, reds and gold hues overlaid and visible depending on the light angle. It is very similar to the bottles that were found in the mud flats of Benicia, CA. except this bottle has no glass etching like those bottle typically have. 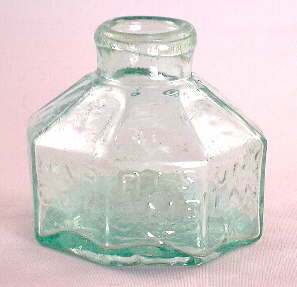 It is 5 1/4" tall, smooth base (embossed with a "4" mold number), tooled patent finish or lip, and dates most likely from the 1870s given the location the bottle was found - the famous "ghost town" of Hamilton, Nevada. 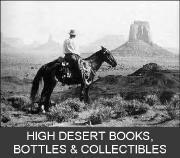 (I purchased it many years ago from the digger of the bottle when I lived in Eastern Nevada.) The origin of Roger's Nursery Hair Lotion is unknown but had to have been shipped in from California like most things to the Nevada mining camps. Patina aside, the condition of the bottle is essentially mint with no chips, cracks, dings, or other post-production damage. The pictures show the iridescence pretty well, but it is more impressive in real life. SOLD! PARK PHARMACY / E. G. COOK / DETROIT - This neat chunk of bottle making iron is an original mold plate - aka "slug plate" - that was used for the production of embossed druggist bottles during the 1910s. It is embossed as noted, as a mirror image of course to the bottles produced by this plate. According to the story I've heard, this - and a small "horde" of such plates - were found many years ago in an old shed at the site of the Whitall Tatum & Co. glass company (Millville, NJ). 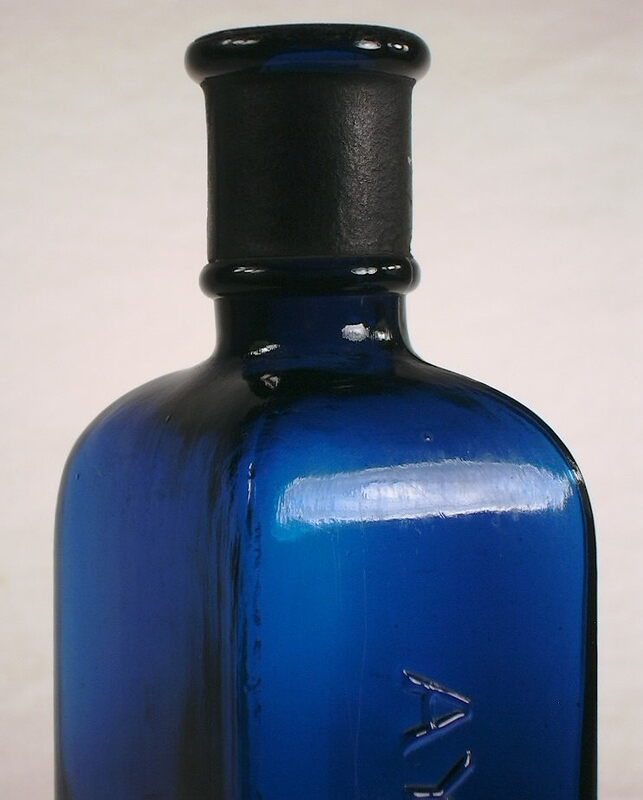 Whitall Tatum & Co. was one of the biggest producers of proprietary (i.e., embossed specifically for a particular customer) druggist/pharmacy bottles from the 1870s to 1930s, including embossed mouth-blown ones until at least 1924. This plate is 3.5" long, just under an inch deep, and 1.3" wide and weighs one full pound. The back of this plate has the engraved glass company catalog or tracking number of P3465E and a screw hole where the plate was secured to the mold. The condition is excellent with just some scattered rust here and there. An interesting feature of this item is that it has the mold air venting holes scattered throughout the engraved lettering. These small pin holes connect with a larger drilled hole that runs the length of the plate. These vent holes allowed for the venting of the hot gases from the mold insides as the bottle was expanding. This plate was procured and used to illustrate the Historic Bottle Website. Great go-with for medicinal and/or druggist collectors and just to those interested in the lore of mouth-blown bottle manufacturing. SOLD! OLD CABIN STILL WHISKEY - Here is a quite interesting - and quite rare and historically fascinating - early machine-made whiskey bottle with the label, original box AND is still fully sealed with around 85%+ of the original contents - all of which date prior (barely) to National Prohibition! The fully intact tax label (covering the cork stopper) notes that the whiskey was "made Spring 1915" and "bottled Fall 1919" - mere weeks before Prohibition was fully in effect in January 1920 (though most liquor was already off the market by early 1919). Click upper bottle close-up to see this on the tax label. The label on the front notes that it was distributed by A. Ph. Stitzel of Louisville, KY. and "Distilled Spring 1915" - click close-up of the front label to see such. The smaller rear label notes that the whiskey was produced by Wright & Taylor (a well know late 19th to early 20th century distiller) and in keeping with the period, was being sold "For Medicinal Purposes Only." Click rear label close-up to see such. The bottle is embossed ONE PINT on the rear shoulder, is machine-made as noted earlier, and has a cork sealed "brandy" style lip or finish. The bottle and labels are essentially mint as shown in the images; box is a bit rough, but mostly largely intact and in good shape as the image shows. Sold only for its historic significance - not the contents (wink) - to those over 21 (no winking there). (Like a teenager would buy this anyway!?) A very cool and unique item which I acquired to illustrate that bottle type on the Historic Bottle Website. I see these type "medicinal" Prohibition era whiskey flasks with the original contents sell occasionally on eBay for $150 to $300 or more; I'll go towards the low end here on this example. SOLD! Genuine late 19th century "lipping" or "finishing" tool - This is the real thing - a finishing or lipping tool used to form the lip of bottles (i.e., "finish" the lip) at some American bottle making company during the late 19th century to possibly the very early 20th, i.e., 1880s to 1910. This particular tool (12" in total length) has the jaws in place to produce a type of "blob" finish which had a slightly protruding ledge at the widest point on the finish's outside surface; click on the image to the right to see a much bigger version where the details show better. I've seen this type modified blob finish on bottles before, though for the life of me, I can't place where. (Any comments on this would be welcome!). This is the typical "calipers" type finishing tool, with a central "centering" plug and two connected springy arms, which was used from the mid-19th century (the first American patent was in 1855) to as late as around 1920. This particular tool was most likely used to produce a "tooled finish" not an "applied finish." How can I tell that? Note how the lower part of the jaws would extend onto the extreme upper neck of the bottle "wiping" out the vertical side mold seams when rotated to "finish" the lip. The wiped out upper side mold seam is a key characteristic of what is called a "tooled finish" on my Historic Bottle Website. The condition of this finishing tool is excellent and could be used to finish bottles today! It still has some bits of the original paint remaining here and there, though most of the exposed metal surfaces are lightly rusted though totally sound. As one can see in the images, the protective sheathing for the handles is intact with some charring on the lower end where closest to the hot bottle. This example was acquired for illustrating glass making tools on my other website and is of particular interest as it allowed for the changing of the jaws to produce a different shaped finish by unscrewing the set on it and replacing it with another set. Very hard to find "go-with" for a bottle collection. SOLD! Keystone in a wreath "shoo-fly" flask - Here is unusual flask that is rarely seen and is quite esthetic. It dates most likely from the 1870s, is a "pint" size (probably a typical 12-13 oz. "scant" capacity), and has some early external screw threads with a ground off top or rim (ground rim is perfect). It is a brilliant medium golden amber in color and has a lot of seed and teardrop bubbles scattered throughout the glass really adding to its appeal. This flask has apparently never been buried as it still retains the original metal (pewter?) cap that is in quite good condition with just a little corrosion. The base has an embossed keystone without a wreath; click on base view to see the keystone embossed in the center of the base. 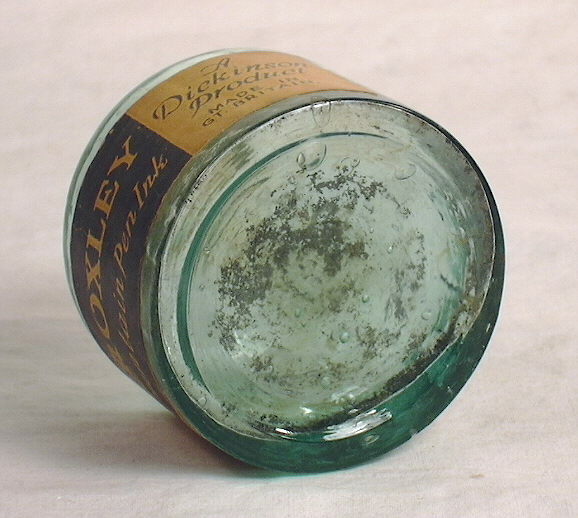 The condition of the bottle is essentially mint with just a few light scuff mark. This is one of the earliest of the shoofly flasks and most likely was made at a Pennsylvania glass works...thus the keystone motif? Regardless of where made, it is a unique item that could be used - with the addition of a cork disk to the inside of the cap - as a current day "nipper" if so inclined. 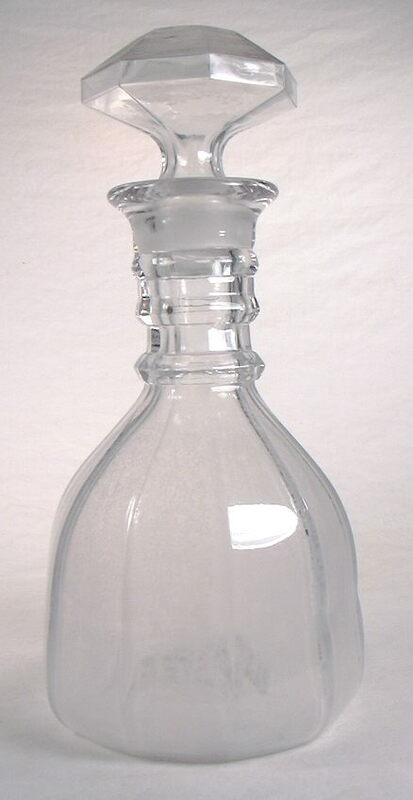 Very nice looking item which I used to illustrate that bottle type on the Historic Bottle Website. SOLD! Root beer amber early umbrella ink - Stoddard manufacture? Well, everyone speculates about that with these early umbrella inks so I won't (or maybe I just did?). 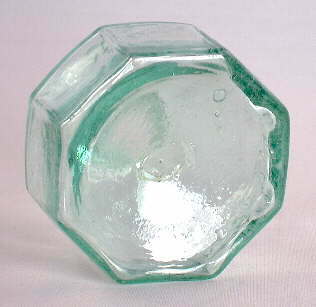 This bottle is a beautiful little jewel that looks like it was poured into the mold. It has sheared and refired straight finish or lip, a blow-pipe pontil scar on the base (click to view base), was blown in a two-piece hinge mold, and dates from around 1845-1855 most likely. The surface of the glass is glossy, waxy, with rippled whittle all over. It may have been professionally cleaned although I think it was fire polished when made - a common bottle treatment at that time with some types of bottles, especially those with sheared or cracked-off finishes like this. Color is a medium to medium dark root beer amber and fairly represented by the image. The condition is just about mint with no chips, cracks, or staining...just one tiny pin point peck mark (with no accompanying issues) on the lower part of one panel. SOLD! 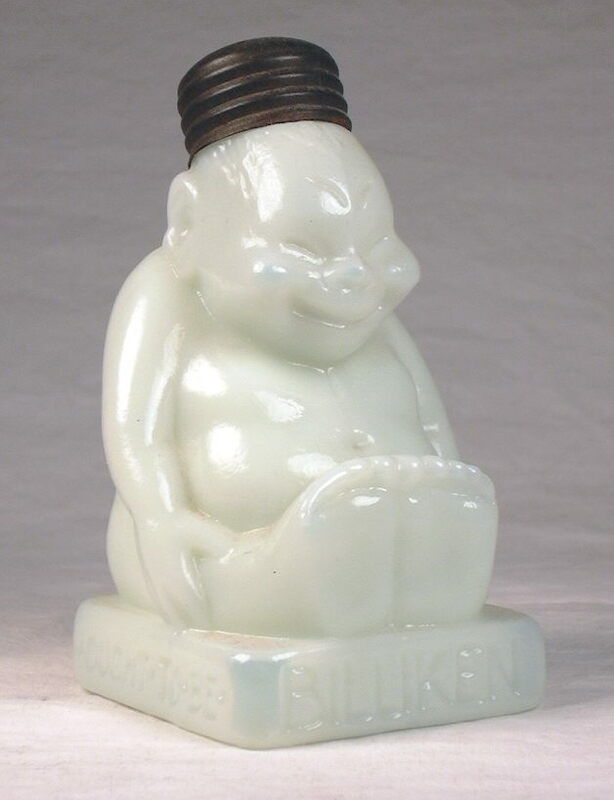 BELLE OF ANDERSON milk glass whiskey bottle. Embossing is in a six-pointed star with OLD FASHION HAND MADE SOUR MASH spread across the six points of the star. 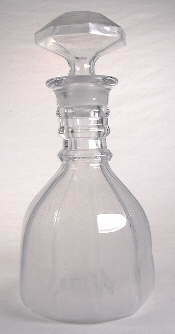 The bottle has fluted shoulders and unusual shape - for a whiskey bottle - and is the smaller (and possibly scarcer) of the two sizes used for this brand (see below). Height is 6 3/4" tall, tooled lip, smooth base, American made in the early 1900s. 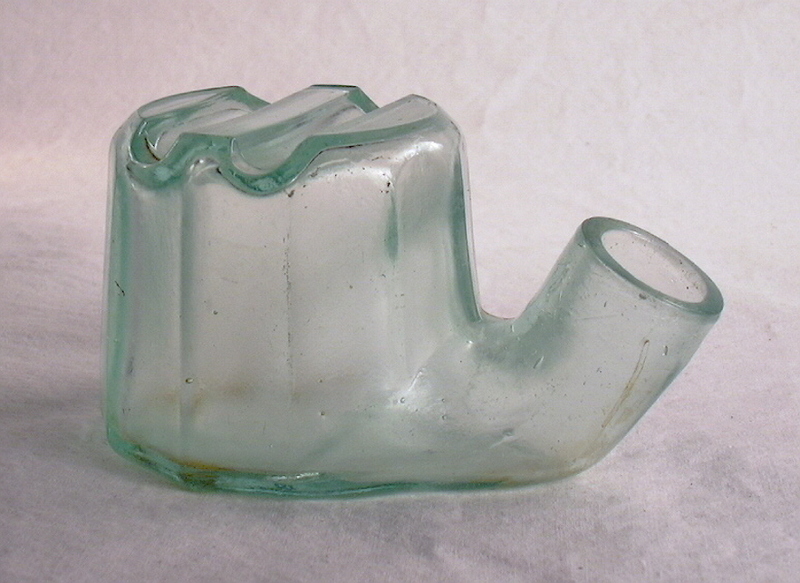 Condition is essentially mint, though there is some very faint in-making glass roughness along one of the sharp edges of the lip - an attribute often seen on the tooled lip edges of mouth-blown milk glass bottles for some reason probably having to do with the in-making texture of milk glass. Great addition to any collection and an unusual whiskey bottle that is really much rarer than believed or the price indicates. The Belle of Anderson brand was sold by the Eisen Brothers of Kansas City, MO. who were in business from 1906 to just before National Prohibition selling a myriad of different liquor brands. SOLD! I've also got an essentially mint example of the larger size of these, i.e., a bit over 8" tall. It is well embossed for these bottles - which tend to be a bit weak - and shown in the image to the far right. Also click HERE to see a larger image of just the large size example showing the embossing well. SOLD! CARTERS gothic style "bulk ink" bottles pair - If there is a better, more decorative and colorful type bottle to grace one's window, I don't know what it would be if not these famous (to collectors) bottles from the 1920s! 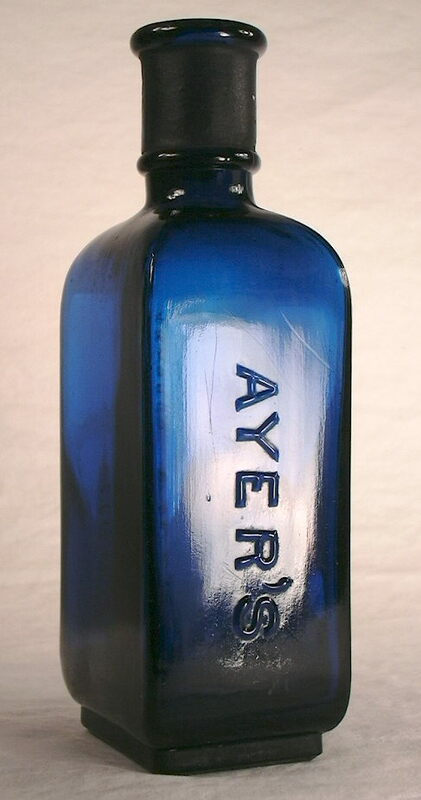 Apparently patterned after - or at least inspired by - the gothic or "cathedral" style food bottles of the 19th century, these early machine-made bottles were used by the Carter's Ink Co. for their RYTO Permanent Ink. 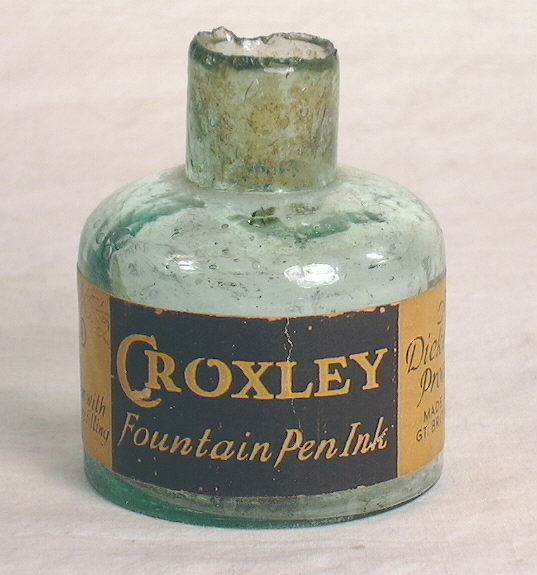 These came in three sizes that looked like these two bottles (which are the two larger sizes) and a smaller ink bottle with a squattier, more "ink-bottle-like" size and configuration. These have CARTER embossed within three panels on each "side" (6-sided bottles) of these taller bulk bottles as well as all the design features you can see in the images. Both also have CARTER'S embossed on the base with a mold number. 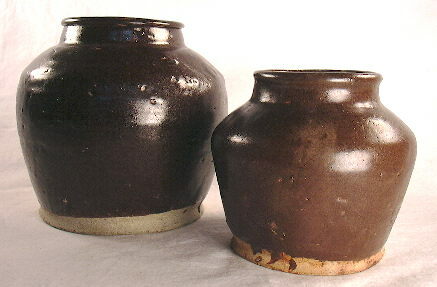 The larger of these is about 10" tall; click large example to see such. The smaller version (actually the "middle" size of the three bottle bulk set) is a bit under 8"; click smaller example to see such. Both are SO incredibly blue that they appear purplish in indirect light. Condition is essentially dead mint as I can't find anything wrong with either example though there could be a scratch or scuff that I can't see. A pair of very nice bottles that have graced my window at one time, but ready to pass them on. SOLD! FLORIDA WATER / MURRAY & LANMAN / NEW - YORK - Here is both a great rarity and an incredibly common bottle. That is, the Murray & Lanman Florida Water bottles are a very commonly encountered bottle, the brand probably outselling all the other brands of Florida Water combined in the U.S. from the mid-19th century until...well, probably today, as the product is still available. However, this example is a great rarity in that it is both labeled and has a blowpipe style pontil scar on the base! Click base view to see such. In fact, this is probably the earliest of all Florida Water bottles dating from as early as 1854 to no later than 1857 or early 1858. How do I know that? 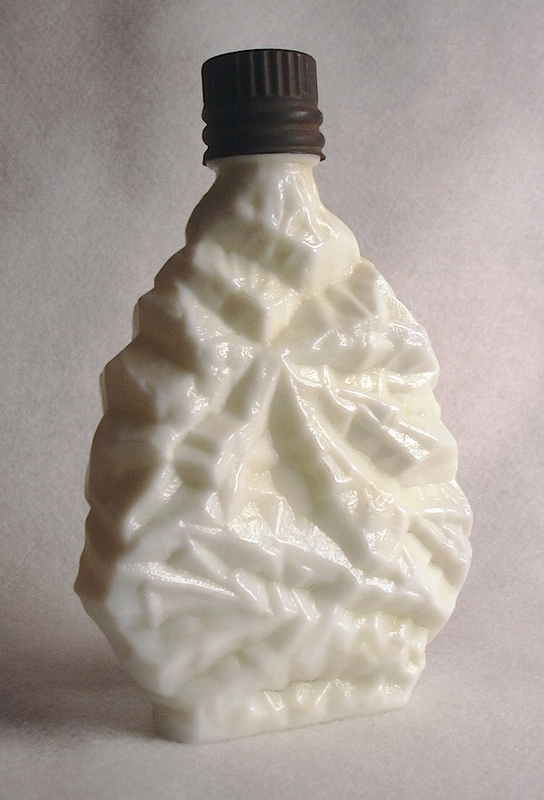 The early example is embossed vertically on the side with FLORIDA WATER / MURRAY & LANMAN / NEW - YORK and actually probably the oldest embossed Florida Water bottle known as it dates from between 1854 and 1857. How do we know that? 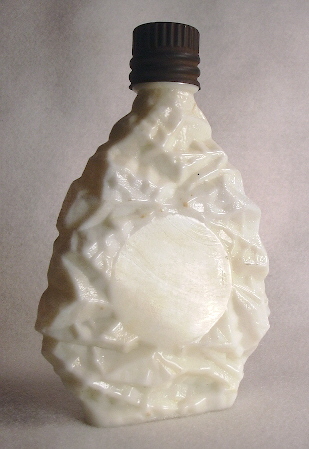 First off, the base has a sharp "blowpipe" style pontil scar within the post-mold base type, indicating a manufacture no later than the American Civil War. It is the only Florida Water bottle known to the author that was early enough to be pontil scarred. Use of the shape by this company as early as the 1850s was speculated on by Sullivan (1994) based on her research indicating that the label was registered in New York in 1857, but she was unaware of this example. However, this is where the manufacturing based diagnostic feature dating ends and the original label takes over. David T. Lanman - in silent partnership with Lindley Murray - was a druggist located at 69 Water Street in New York from 1836 to 1854. He did business as a "wholesale druggist" at the same address from 1854 to 1857 under the name D. T. Lanman & Co. - Murray having left the partnership in 1854. That same year, George Kemp was also listed as doing business at that address; he apparently being the "Co." in the name at that point. The partnership of Lanman & Kemp was formed and operated at that same address from 1858 to 1870 when they moved to another NYC address. So this bottle can date no earlier than 1854 and no later than 1857 or early 1858 depending on when that years New York City directory was published (Wilson & Wilson 1971; Holcombe1979; Sullivan 1994). That about tells the story of it! The bottle is perfectly mint and has the original lead foil "capsule" on the upper neck and lip. The original label is about 99% complete and does have a fair amount of water staining though it retains vivid colors and virtually all the detail is intact; all that missing is some chipping along the label edge. The pontil scar sticks out about 1/4" on one side and truly is sharp enough to cut ones finger easily. 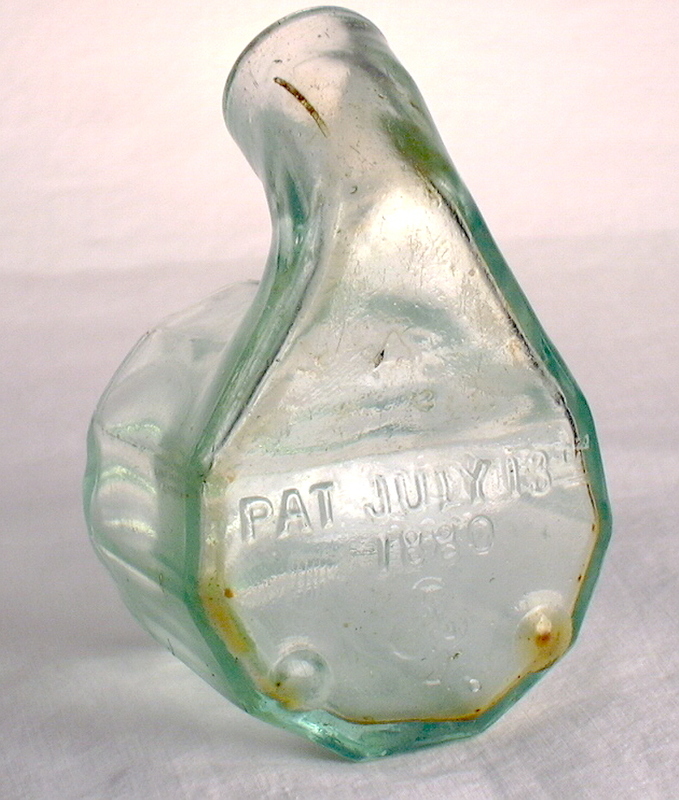 The body of the bottle is nicely whittled and there are stretch marks on the neck, though both are obscured largely by the foil on the neck and the label. I've had this bottle for about 40 years originally purchasing it from a seller in OBX magazine, I think. I know of one other labeled example which I saw about 40 years ago also (this may be the same example) but that's it...and it likely was found with the listed one here. Recently, a nice example of a pontiled one sold on eBay for over $400 - without the label or foil capsule. Here is the complete meal deal, so to speak. Time to pass this one on. SOLD! AMMONIA / MNFD. BY / S. F. GASLIGHT CO. - That is embossed on the larger (quart) size of the pair of bottles offered here; click close-up of embossing to see such. The smaller (pint) example is embossed a bit differently as follows: AMMONIA / MANUF'D BY / S. F. GASLIGHT CO (i.e., with no period after the CO and MANUF'D instead of MNFD; click to see embossing.). Why the embossing is different on the two I don't know, but obviously they were different molds and were likely produced a few years apart (more below). I'm offering this pair together since they go together so well and both were acquired together in Nevada. Both bottles have tooled "patent" lips or finishes, are of a typical blue aqua colored glass indicative of being blown at the SF&PGW, and are essentially in mint condition with no chips, cracks, nicks, basically no staining (a bit in the base of the smaller one though it may just be dirt) or anything distracting. 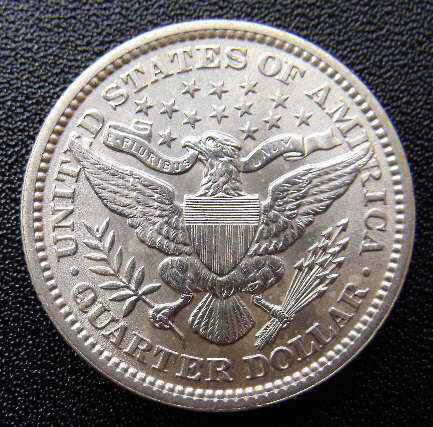 More specifically, the quart (full size image available here) was produced in a post-base mold and has the unusual "blob" type air venting on both front and back shoulders that indicates manufacture in the early-ish 1880s according to research done by the late John Thomas. (These same type air venting marks can be seen on the shoulder corners of the earlier PERUVIAN BITTERS from SF.) 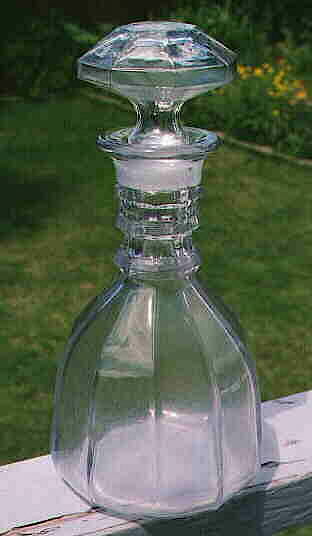 The bottle has nice crudeness in the way of wavy glass, stretch marks on the lower neck, and a lot of seed bubbles in the glass. Oh, and it has a backwards L embossed on the base...some cryptic mold tracking symbol I guess? It is almost identical in size (height and diameter) to the well known U. S. A. HOSP. DEPT. bottles found during the late Civil War to early 1870s period, though this bottle is a bit later. The embossing is proportionally rounded and wide - like many SF&PGW bottles of the era exhibit (no curved "R" since there are no "R"s) - and pretty bold; click on embossing to see it close-up. The pint example was produced in a cup-base type mold and has the somewhat later (mid-1880s to 1890s) single "dot" air venting mark on the front & back shoulders. The embossing on this example is also pretty good (click on AMMONIA / MANUF'D BY / S. F. GASLIGHT CO to see such) but a bit more flattened on the first two lines than the larger example...but is all distinct. This one has even more seed bubbles in the glass, neck stretch markings and other nice crudeness...and is also essentially mint as noted earlier except for some wisps of dirt or haze in the very bottom. A nice, visually appealing pair of larger, interesting Western made bottles! SOLD! Pacific Beer, Tacoma, Washington pre-prohibition advertising tray - The Pacific Brewing & Malting Co. of Tacoma, WA. was a major early 20th century Tacoma area brewing company that bit the dust (or possibly moved to California) in 1915 - according to Dale Van Wieren's "American Breweries II" book - when statewide alcohol Prohibition was self-inflicted on that state's residents a few years prior to National Prohibition. This tray probably dates from between 1905 and 1915 and was manufactured using the printing techniques of the era, having the "dot pattern" (upon close inspection) similar to what sees on same period trade cards and lithographs. The tray has in VERY small print in the gold strip below "TACOMA" - CHAS. W. SHONK CO. LITHO CHICAGO NO. J4117 - the maker of the tray. The tray has an image of Mt. Rainier which is called Mt. Tacoma in the illustration (above the peak along with the 14,256 ft. elevation) which was the local Indian name for the mountain (though spelled a myriad of different ways over the years). Condition of the tray is excellent with virtually no wear or chipping to the decorative front side (click image to enlarge) - really just a few light scratches - and little wear to the solid green painted back. (Click image of the tray back to see such.) If I remember right, there were a few lightly to essentially unused examples of these trays discovered somewhere in the NW back in the late 1960s or very early 1970s (when this was acquired) in a couple different color schemes but with the same design. I see one every now and then on eBay though they still seem to be somewhat scarce and one of the more affordable, pre-Prohibition Western beer trays. SOLD! Cocaine producer paperweight - This is great go-with for the medicine bottle collector and an interesting reminder of how loose times were prior to the FDA and Pure Food and Drugs Act of 1906. 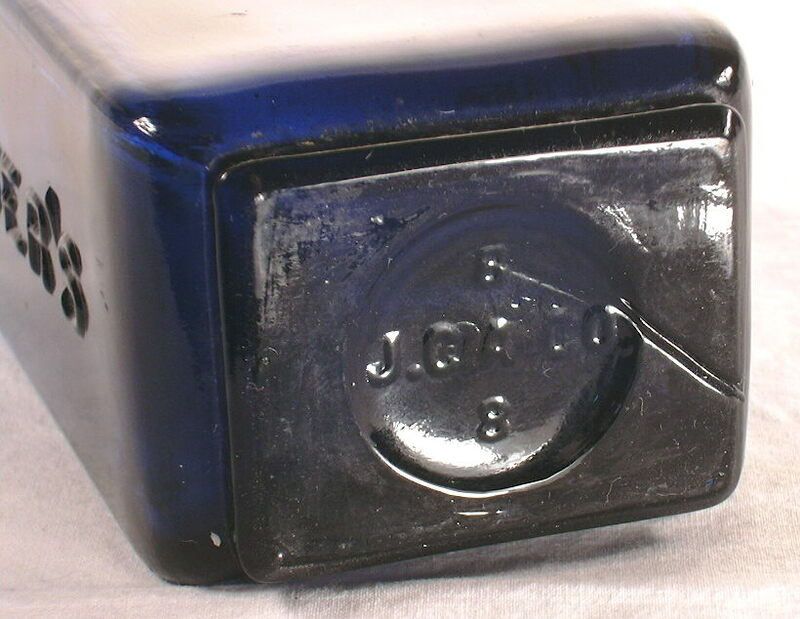 This paperweight has the following writing inside in addition to the illustration of the factory where the "goods" were produced - FERRATIN, LACTOPHENIN, IRON TONIC and FOOD. ANTIPYRETIC, SEDATIVE, ETC. WORKS OF C. F. BOEHRINGER & SOEHNE, MANNHEIM, GERMANY - (then the large illustration of the factory) - LARGEST MAKERS IN THE WORLD OF QUININE AND COCAINE. NEW YORK OFFICE 7 CEDAR ST. Cocaine was a common ingredient in many patent medicines during the last half of the 19th to early 20th centuries as it was known to "...give great vigor to the nervous system...is of great value to public speakers and timid persons" (as per the Frederick Stearns & Co. druggist's catalog 1886). This cool paperweight is about 4" by 2.5", backed in white enamel over the black and red transfer print, and dates probably from the 1890s to maybe 1910 or so...though it is hard to say for sure. "Ferratin" was an alleged nutritional enhancement that promoted health; click on the following link for information from an 1894 medical book: Ferratin discussion. Certainly this was a salesman's give-away in the U. S. since it has the New York office listed and is in English. Condition is excellent with just a bit of minor scratching on the upper surfaces and a scratched spot on the reverse white enamel which does not go through the surface at all. Regulated drug (today that is) related go-withs which note opium or cocaine or the like are highly collectible items in recent years. SOLD! BLATZ - Milwaukee, Wis. - Old Heidelberg Brew beer tray - This is an esthetic beer tray that was reportedly produced during Prohibition (ca. 1920s) for the "near beer" product of Blatz - Old Heidelberg Brew...not "Beer." The label on the bottle confirms this somewhat as it does state that the product "Does not contain...of alcohol by vol..." (the missing parts are off the edge of label graphic). This is also confirmed on the www.Trayman.net website (great resource BTW). The tray was made - according to small print in the lower right corner - by the The American Art Works, Inc., Coshocton, Ohio. Size of the tray is a rectangular 13.25" by 10.5" by 1.25" deep. It has some chipping and edge wear as can be seen in the enlarged photo (click to see a larger version) but is overall a nice looking tray with good graphics and pleasing overall nice design...and an embossed BLATZ bottle! (Which is what attracted me to the tray.) The bottle graphics itself are almost untouched, with most of the wear/chipping in the vicinity of BREW and along the rim. The back of the tray also has spots where the paint has worn off but the tray has no dents at all. I actually acquired this tray in Ely, Nevada about 30 years ago of all things; time now to pass it on. Incidentally, a near mint example sold on eBay for $373 a few years ago; this one is certainly not mint but priced accordingly. SOLD! "Clam flask" - Here is another interesting figural liquor (probably) flask from the late 19th century. These can be dated pretty well to the early 1890s as they were patented on December 27th, 1892. Click clam flask patent to see the original patent. I'm not sure about all these clam flasks as this is the only one I've possessed, but this one is embossed with PAT APPL'D FOR (somewhat hidden in the embossing in the image to the right; click to enlarge) indicating that it - or at least the mold for it - was made in the early 1890s as the patent indicates it was filed ("applied for") on December 10th, 1890. Cool information, eh?! This example is about 5.5" tall (from the top of the original cap to furthest tip of the shell), colorless (aka "clear") glass (a few of these were also made in cobalt blue amazingly! ), and has a ground rim to the threaded finish with a bit of grinding induced flaking (and a small grinding related iridescent spot) as is typical with handmade (aka "mouth-blown") screw thread finish bottles to remove the rough glass from the point the blowpipe was cracked off. It probably holds 4 or 5 ounces and the cap still has the original cork disk liner inside it...making it useable if one so desires. A bit of a "traveler's companion" if you will. The flask is in mint condition with no chips, cracks, dings or other post-manufacturing damage. It does have some light content haze on the inside; sparkling clean on the outside as it has certainly never been buried. Nice flask! SOLD!